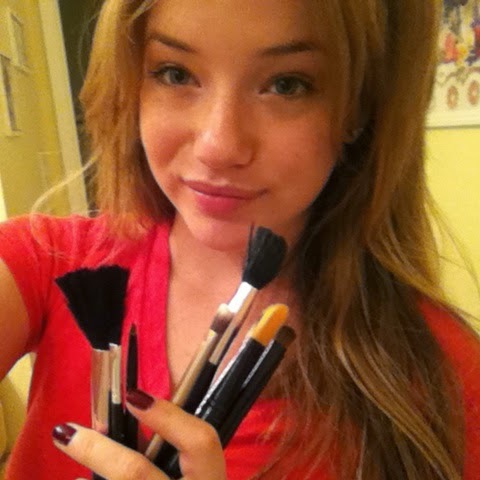 and your brushes are only as clean as where they are stored. It is key that you wash your brushes regularly, I do them all in one sitting because it’s more time efficient, hey, but if doing a few here and there work better for you, then by all means. Makeup brushes come into contact with bacteria and oils that you will not want to put in contact with your face or your makeup. I, for one, want to keep my Naked3 pallet as clean as possible; it’s not a petri dish! Also, those bacteria can cause breakouts throughout your face… which I am pretty sure no one in the world enjoys. So let’s keep our brushes as clean as possible, agreed? I’ve been using Michelle Phan’s Squeaky Clean Brushes technique, from way back in 2010, for a couple of years. It works great for me so I don’t see a reason to purchase a cleansing product. In her video, Michelle Phan uses a Dawn antibacterial Soap and Extra Virgin Olive Oil mixed together. Tadaa! That’s all you need! I dry my brushes differently; I pat them dry a few times with different towels, so they actually are mostly dry before they go upside down in a jar. I don’t keep them in a jar for long, just long enough to clean the bathroom. I like to stay on top of cleaning my bathroom, so I do it as regularly as I wash my brushes. I start by removing everything from my makeup drawer (I know, I don’t have much!) and then cleaning the wooden bottom. After, I clean my white plastic organizer that I got way back in 5th grade, so mind some of the stains! After I’m done washing my organizer, I place it in the drawer and lay my products into the drawer. I recommend brushing the outside packaging of the products-sometimes when I pat off my bronzer, the excess powder falls onto some of the items in the drawer. It just helps things look cleaner. Don’t forget to clean your counter! I sometimes place my brushed on the counter while I grab at a few eye shadows. Don’t make the mistake of placing your brush on a dirty counter; make sure it’s cleaned up. Cleaning the counter is so fast and easy, so you really don’t even need a whole minute to do it. Be lazy like me and just wash off the spot that you are using! How do you store your brushes? Do you have any other ways to clean them? I’m interested, so leave your comments below! Gluten and Dairy Free Waffles?